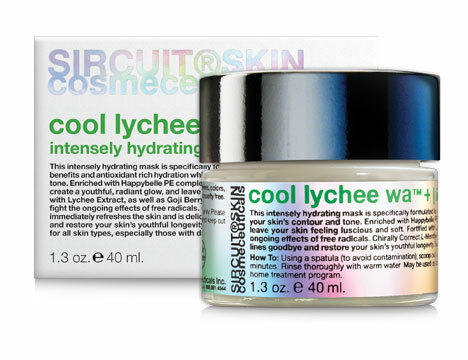 Cool Lychee Wa™+ intensely hydrating mask is specifically formulated to deliver powerful anti-aging benefits and antioxidant rich hydration, while helping to improve your skin's contour and tone. Enriched with Happybelle PE complex that dramatically helps to restore surface moisture creating a youthful, radiant glow while leaving your skin feeling luscious and soft. Fortified with Lychee Extract as well as Goji Berry, Mangosteen and Resveratrol that help fight the ongoing effects of free radical damage while Chirally Correct L-Menthyl Lactate complex, derived from Lactic Acid and Menthol, immediately refreshes and is deliciously cooling. Kiss those fine lines goodbye and restore your skin's youthful longevity by delivering first aid to dry skin! Green glamour defined, Mother Nature approved! Improves skin's vitality, radiance and luminosity. Combats dryness to restore comfort. 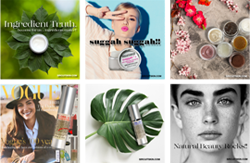 Skin Type: Suitable for all skin types, especially those with dry, lackluster and/or dehydrated skin types. How To: Using a spatula (to avoid contamination), scoop out a small amount and apply to face and neck using gentle upward movements. Leave on for 10-15 minutes. Rinse thoroughly with warm water. May be used as often as desired. Use on cleansed skin, alone or in combination with serums as part of your daily home treatment program. Lychee (Litchi Chinensis Pericarp Extract): Contains significant amounts of polyphenolic compounds and exhibits powerful antioxidant activity. Happy Belle-PE: A neuro-peptide with phytoendorphins that help to make the skin appear more radiant and healthy and feel happy. ​Formulated With: Aqua (Water), Glycerin*, Caprylic/Capric Triglyceride, Stearic Acid, Cetyl Alcohol, Polysorbate 20, Butylene Glycol, Glyceryl Stearate, Polygonum Cuspidatum (Giant Knotweed) Extract, Lycium Barbarum (Goji Berry) Fruit Extract, Litchi Chinensis Pericarp (Litchee) Extract, Passiflora Incarnata (Passionflower) Flower Extract, Camellia Oleifera (Green Tea) Leaf Extract, Garcinia Mangostana (Mangosteen) Fruit Extract, Vitex Agnus Castus (Casticin) Extract, Mentha Piperita (Peppermint) Oil*, Lonicera Caprifolium (Honeysuckle) Flower Extract, Lonicera Japonica (Honeysuckle) Flower Extract, Hamamelis Virginiana (Witch Hazel) Water, Squalane, Elaeis Guineensis (Palm) Oil, Tocopherol (D-alpha), Glucuronolactone (D), Ascorbyl Tetraisopalmitate, Epigallocatechin Gallate, Allantoin, Caprylyl Glycol, Tocotrienols, Lecithin, Cyclodextrin, Vanillin, Xanthan Gum, Menthyl Lactate (L), Potassium Sorbate, Citric Acid, Phytic Acid, Alcohol Denat., Sodium Hydroxide, Phenoxyethanol. *USDA Certified Organic | NOP. Phthalate-free.